WHAT'S THE DIFFERENCE between the Cellways Rotating Selfie Stick and others? 2 AXIS ROTATION: Most other selfie sticks can only rotate on one axis: front/back 270 degrees. Ours can rotate on two axes: the patented 360 degrees rotation holder enables more use modes. 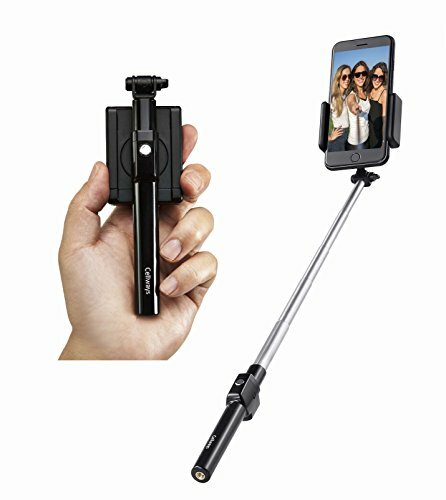 LANDSCAPE & PORTRAIT MODES: Most other selfie sticks are only good for taking LANDSCAPE pictures; users have to twist their arm to take PORTRAIT pictures. Instead of awkward arm twisting, ours can be switched between the two modes simply by rotating the holder. MULTIPLE MODES: Not just a selfie stick! Ours can be set up as a stand to watch videos or pictures hands-free. Most other Bluetooth-embedded selfie sticks don't have a SCREW HOLE because the charging port occupies the bottom side. Since our charging port is on the front, we have a screw hole on the bottom for mounting with a tripod, ideal for live streaming and distance selfies. COMPACT SIZE: Most other selfie sticks are quite bulky when they are attached to a phone. When not in use, users may have to either disassemble them or just carry the bulky combo around. Since ours can be folded away and stored behind the phone, the whole unit can be held in the PALM of the hand, ideal for carrying. THE WORLD'S SMALLEST Bluetooth-embedded selfie stick: It can be fixed with your mobile phone IN ONE UNIT that can be easily carried in your pocket or purse. 360 DEGREES ROTATION HOLDER (Patented): Simply rotate the holder to switch between landscape and portrait modes, or any angle. MULTIPLE MODES: It's not just a selfie stick: the tripod allows it to be used as a stand or a mount, which is ideal for live streaming or long-distance selfies. UNIVERSAL: Built-In Bluetooth Remote Shutter: Works with All iPhones (iOS 5.0+), Samsung Galaxy, Note, Android Phones (4.2+). Universal Phone Holder: fits most phones sized 3.5" to 5.8"
WITH 1/4" SCREW HOLE: It can be mounted on tripod (not inclouded ) for volgging or distance selfie. If you have any questions about this product by Cellways, contact us by completing and submitting the form below. If you are looking for a specif part number, please include it with your message.